In the spirit of Earth Day we organised a trip to one of our favourite spots in Beijing, the Huangcaoliang Plateau, and spent the afternoon picking up as much as we could of the rubbish and litter that has accumulated on the plateau and on the path up. 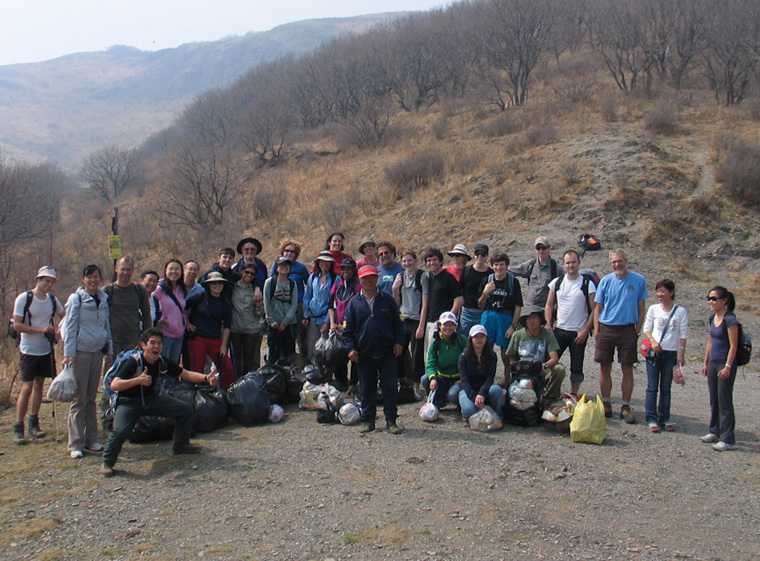 Through the efforts of the people that joined the hike, we collected over thirty bags of rubbish, which were then stuffed into larger bags and lugged down the hill for disposal at the nearest village. We collected a lot of plastic water bottles, more than a few beer and baijiu bottles, plastic wrappers, paper and tissues, instant noodle bowls, plus something that appeared to be a bedpan. Besides collecting the trash and litter, we had productive conversations with other hikers we met, hopefully inspiring greater awareness of environmental issues. The cleanup hike wouldn’t have been possible without the people that came along to help, and we extend our thanks for all the hard work. Special thanks go to Zach, who had the idea of doing the hike and did an excellent job in the organisation. Following are a few photos from the hike. A team from the UK Research Councils also joined us, and you can see their photos on the RCUK website. The cleanup crew. Click for a larger picture. On the way up to the plateau. Cleaning in the brush near the top. Filling up big bag one of five. Doing more work in the brush on the plateau. Many small bags were collected. Lunch break during trash collection on the plateau. Bags of trash and litter.